Dan Kitwood/Getty Images(LONDON) — France’s prime minister has announced “an international architecture competition” to rebuild the iconic arrow-like spire atop the Notre Dame Cathedral in Paris, which caught fire on Monday evening. “Should we reconstruct an arrow? The same? Adapted to the techniques and challenges of our time? 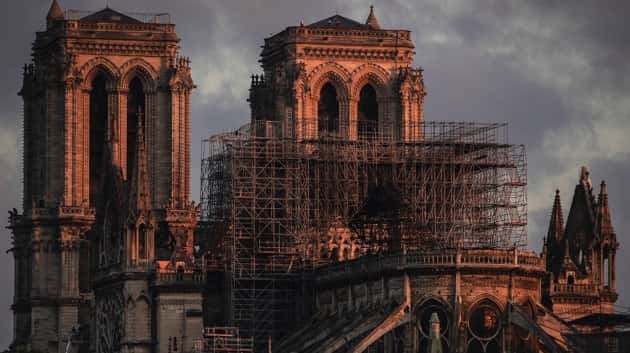 An international architecture competition for the reconstruction of the cathedral spire will be organized,” French Prime Minister Edouard Philippe wrote on Twitter Wednesday. Valerie Pecresse, president of the Ile-de-France region that encompasses Paris, called it a “miracle” that the walls of the cathedral are still standing. French President Emmanuel Macron said in a televised address Tuesday that he wants to see the fire-gutted cathedral restored in five years and it will be “even more beautiful.” Nearly $1 billion in donations from worshipers and billionaires around the world has already been pledged to help rebuild it.